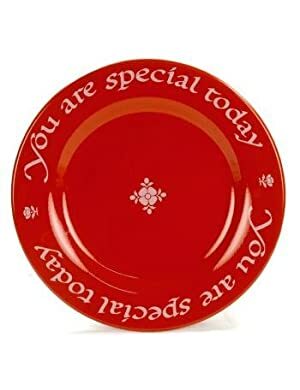 Have you heard of the “You are Special” Red Plate? I first learned about this concept from a mentor mom in my MOPS group several years ago and it has been a tradition in our home ever since. The basic idea is simple. When setting the table for a meal, give one child the “red plate” and tell them it is because they are special and you love them. It could be because they scored a goal in their soccer game, or it could be because they got 3 fillings at the dentist. It could be for no reason at all — it’s just a great excuse to single out a family member and let them know they are special. When someone gets the red plate at our house, we will go around the table and tell them something we love about them. My mentor mom told me they made up a song to sing, “You are Special, you are special…” cheesey, yes, but you know that child felt loved. You don’t even have to spend money on a fancy “You Are Special” plate. We started this tradition when the aforementioned mentor mom gifted all the MOPS moms with a simple red ceramic plate. My kids loved that plate and were seriously bummed when someone dropped it and it broke. I finally replaced it with a melamine red plate I got at Target (costs less than $2) and they are thrilled. Another option would be to hand decorate a plate. This could be something you make for your kids, or something they design. You can buy a “Make a Plate” online at Amazon or many other places. There are lots of cute handmade items on Etsy as well. When my kids set the table, they will often decide on their own who gets the red plate (but it’s not an every night thing). Sometimes they choose themselves, other times a sibling. And let me tell you, when I come in and find someone has put the red plate at *my* place, I feel pretty darn loved too. Even our 3 year old gets the concept and loves the red plate. This is such a simple an easy way to show your kids you love them, I highly encourage you to develop your own “red plate special” tradition. Works For Me Wednesday, hosted by We Are That Family.